The J&K Police have started investigation after the picture of a Hizbul Mujahideen militant with an American M4 carbine surfaced on the social media. 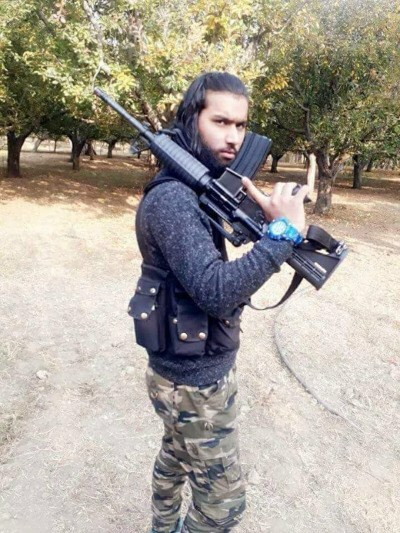 The picture of Hizb militant Sameer Bhat, alias Sammer Tiger, holding the American M4 carbine in an orchard somewhere in southern part of Kashmir surfaced on the social media on Thursday and was shared by netizens. Sameer is a resident of Drabgam, Pulwama, and operates in the district. Police officials say that the investigation regarding the matter has begun. The US armed forces extensively use the M4 carbine, replacing the M16 rifle. “We suspect that the US gun in the picture has been smuggled into Kashmir by Jaish-e-Mohammed militants from Pakistan, who infiltrated in the past few months,” a police officer said. As per latest intelligence inputs, Jaish fidayeens are the new “force multipliers” of the Pakistan apparatus to keep the pot boiling in Jammu and Kashmir in the wake of massive offensive against top militant commanders in Kashmir.